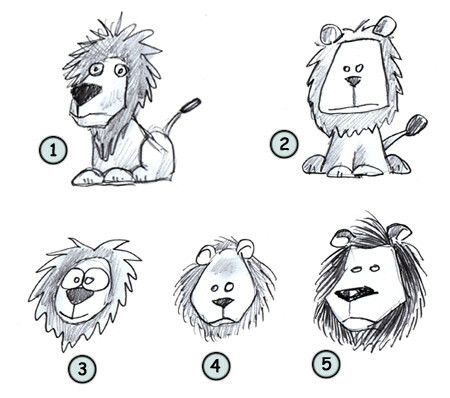 Drawing a cartoon lion: some fun facts before starting sketching! A lion is usually an excellent swimmer. Lions will prefer to hunt at night when it's cooler. A lion can run at a speed of 40 mph for a short period of time. Take a look at the shapes of this animal. It's pretty obvious that the mane is really visible. 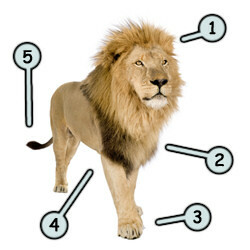 But it should not hide the fact that the lion has also a muscular neck and a strong back. I guess we could say that the lion is a killing machine that is also able to walk with grace and attitude. The nose of this animal is also a little wider than what we usually see on a tiger or a cat. Let's start our lesson by sketching two rectangles for the head and the body. Make them a little bit narrower on top. Next, draw two small circles for the ears. Then, add the legs and draw a circle as the starting point for the mane. Next, draw the mane using the circle as a guide. You can finish your work by sketching the tail and all the details on the face. Don't hesitate to play with some parts of your lion. You can easily draw one with a big mane and a big nose (1). Just use your imagination! Good luck!